The true cost of Low Back Pain in America is staggering. Billions of dollars are spent annually on the treatment of debilitating and painful symptoms as wells as lost productivity in the workplace. The vast majority of individuals will experience lower back pain at some time and half of working Americans experience back pain each year. Sports Injuries, Accidents and Poor Posture are common causes of Lower Back Pain. Fortunately, Caron Chiropractic Clinic, P.A. 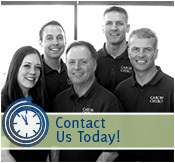 in North Oaks, MN can use Chiropractic Care to Alleviate Back Pain Without Medication. Back pain is so commonplace in American society that Chiropractors have developed effective ways to Alleviate Back Pain Without the need for Medications or Surgery. The Caron Chiropractic Clinic, P.A. in North Oaks, MN utilizes Chiropractic Care to treat the root cause of the problem and stimulate the body’s innate healing ability. Both Surgery and Medications have risks that must be seriously considered before moving forward as a form of pain management. Chiropractic Care is based on the principal that the human body was designed to self-heal. Correcting structural imbalance of the spine can affect the body on the cellular level by opening up natural healing pathways in the spine. Spinal adjustments often get to the root cause of back pain and its symptoms. Chiropractic treatments are a widely recognized Natural Remedy for Low Back Pain because they can be so effective without the risks of meds or surgery. Caron Chiropractic Clinic, P.A. has a very experienced staff of medical professionals including Licensed Chiropractors. We believe in using Natural Remedies for Lower Back Pain that avoids the risks associated with medications or surgery. Whether the source of your Low Back Pain is an Auto Accident, Sports Injury or Poor Posture, Chiropractic Care may be your most effective treatment to Alleviate Back Pain Without Medication. This entry was posted	on Friday, September 4th, 2015 at 2:32 pm	and is filed under Back Pain, Chiropractic Treatments. You can follow any responses to this entry through the RSS 2.0 feed. You can leave a response, or trackback from your own site.